Various people have been commenting in a previous post that Ventura has left Hamburg this evening. And indeed she has – I was there, I saw it. Well, not quite – I stayed in Sheffield and looked at the webcam! She backed out of the dry dock just before 10 o’clock UK-time, and then moved off pretty smartish – she was well underway down the Elbe by 10:15. She’s still not showing up on AIS, however, but at least we know she’s on her way home. The picture above is a very blurry grab from the web cam as she got underway – sorry, it was the best I could do. For all those cruising on her on 7 April – I would be very interested in hearing your views of Ventura post-refit, especially if you’ve cruised on her before. Please email me at tom[underscore]burke[at]mac[dot]com . Further update 10:00 5 April: As someone has commented (see below), it looks like that was a glitch on the P&O website. She’s now showing a long way further west, off the islands to the north of the Dutch coast. Still not showing up on AIS, though. Update: 08:30 5 April: Ventura’s AIS still seems to be turned off – certainly she’s not appearing on AIS. 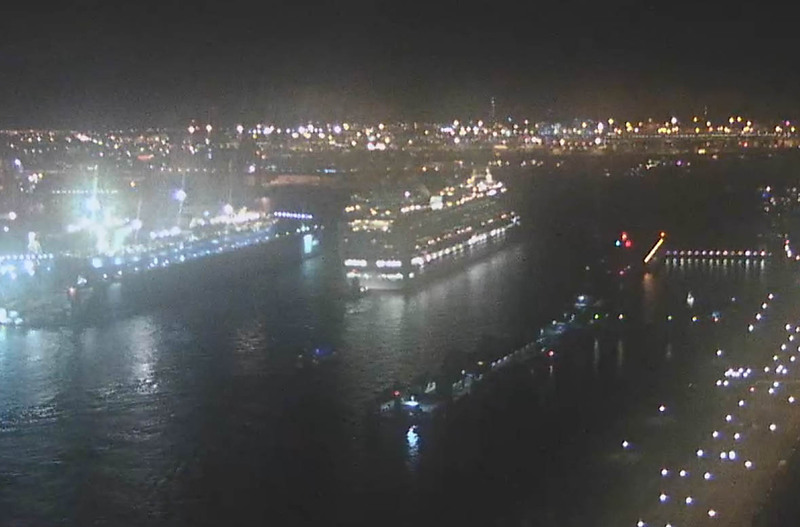 But according to the Webcam & Tracking page for her on the P&O website, she’s just off the town of Otterndorf which is on the south bank of the Elbe estuary. I first checked her on this page at about 7 o’clock this morning and then again just now, and she doesn’t appear to have moved. Her webcam picture doesn’t show any obvious indication of progress being made, either. She’s travelled about 80 kilometres or perhaps a bit more from Hamburg and given that most of that would have been within the River Elbe and therefore subject to speed restrictions, that’s fair progress. Odd, though, that she should apparently not be moving now. I think there must have been a delay in the website updating. I looked on the P&O site at about 6AM and she was in the same spot until about 10AM. The website then updated and she had suddenly made lots of progress. So all looks good! I’m watching the progress of the ship with interest. We are booked on the cruise this Sunday and was worried about the propulsion problems in the Atlantic. First time on P&O – we usually do celebrity so will be interesting to compare. Will also be keen to see how Atul, Ozzie , and Marco add to the experience! Whoops Ollie – Ozzie is on a different cruise line!